Application for workshop is now closed. This workshop seeks to connect recent developments and open questions in the theory of compact manifolds with special or exceptional holonomy (especially G_2 manifolds) with other areas of mathematics and theoretical physics: differential topology, algebraic geometry, (non compact) Calabi-Yau 3-folds, K3 surfaces, submanifold theory, J-holomorphic curves, gauge theory and M-theory in particular. One of the aims of the workshop is to bring to wider attention some of the problems in other parts of mathematics that have arisen recently in the theory of compact G_2 manifolds and to bring together experts from these disparate areas. This workshop is a part of the Fall 2014 program, G2 manifolds, which is organized by Simon Donaldson, Mark Haskins, and Dietmar Salamon. This program takes place from August 18 – October 3, 2014. *Please note: This workshop starts on Tuesday, September 2nd, 2014 due to the US holiday of Labor Day on Monday, September 1st. The Simons Center will be closed on September 1st. All workshop talks will be held in the Simons Center Lecture Hall (Room 102). Please note that on Tuesday, 9/2, at 4:00pm Matthias Kreck’s talk will be held in the Simons Center Auditorium (Room 103). 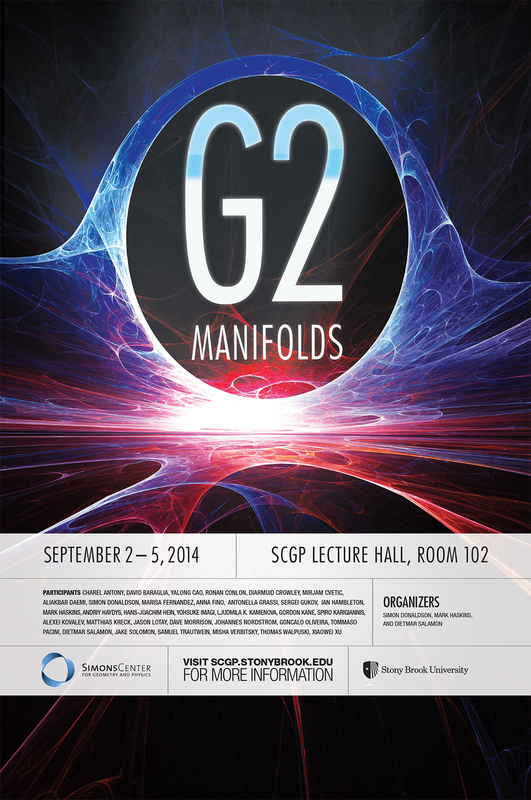 This talk is both the G2 manifolds workshop talk & Math’s Geometry/Topology seminar.